Spring-cleaning was originally a very gruelling but very necessary process, following long winters of heating a home with wood, kerosene and candles that left layers of soot, dirt and greasy residue on everything in the home. 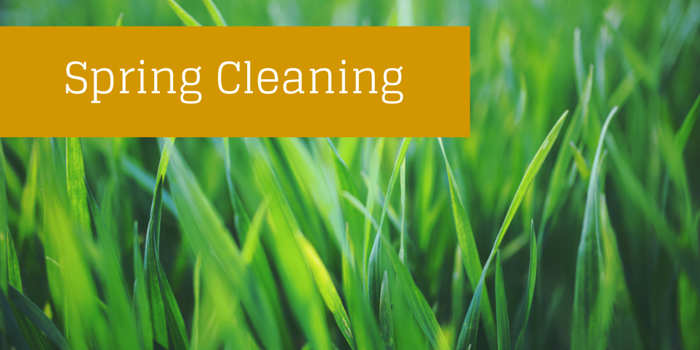 Now less rigorous, spring-cleaning is an exciting time of year. It’s a time to open windows, let the sunshine in and remove a whole winters worth of dust mites, grime and clutter. Although cleaning doesn’t top most people’s list of fun things to do there is a great amount of satisfaction that comes from a job well done and a sparkling clean environment, so throw on your favourite music, round up the family and use this helpful guideline to get the most out of your spring cleaning hours. Such a long lists of tasks can be daunting, make it less overwhelming by making a checklist. Break things down room by room and be sure to include everything, even the smallest of jobs as you will be likely to forget things once knee-deep in the process. Items on the checklist should include regular, routine tasks like washing floors, but extend into very detailed things like re-grouting tile, washing walls and mouldings, carpet shampooing and laundering upholstered items. Before jumping in, make a list of supplies you are going to need to do a good job. You will need various cleaners, cloths and brushes as well as broom and dustpan, plenty of garbage bags, and a vacuum and mop. Some people are hesitant to use harsh, abrasive cleaners, and if that’s you, you’ll be pleased to discover that plenty of good alternatives are available right under your nose at home. Consider using natural ingredients like vinegar, boric acid and even toothpaste, a quick Internet search will provide lots of recipes and tips. Just as important as the cleaning, the big clean provides an excellent opportunity to declutter all areas of your home. Before starting the process, designate a bin for every member of the house to place items of question in, and systematically move through the rooms designating things for keeping, for donating and for storage. Think about your furniture as you go through rooms and decide whether items are really useful, or whether your rooms would be better off without them. If you have items that are sentimental to you, but don’t quite work with your home, think about putting them in storage so that you can still have them available should you want to give them as a gift, or get them out of storage as your décor changes. Proper time management is essential when planning a good spring clean. Plan to take about a week’s time to properly complete the job and stick to a schedule. Such hard work can be exhausting so be sure to delegate to the family, plan some simple easy meals and lots of rest. Once done, a nice family meal in your decluttered house can be a celebration of a job well done!